We have been going through so many raspberries at home. Both boys love them and I may have been sneaking a few too. I had few packs in the fridge and thought I'd give baking with fruit a go. I've only really tried crumbles in the past not actual cakes with them. This came out lovely light and crumbly. A yummy texture and flavour. Perfect with a cup of coffee or topped with creme fraiche and a few more raspberries. And an optional extra - some white chocolate. Creme butter and sugar together until fluffy. Beat in the eggs and milk until combined. Fold in the flour and ground almonds. I stirred 3/4 of the raspberries given them a good smooshing as I went. Here I also added the chocolate to the mix. 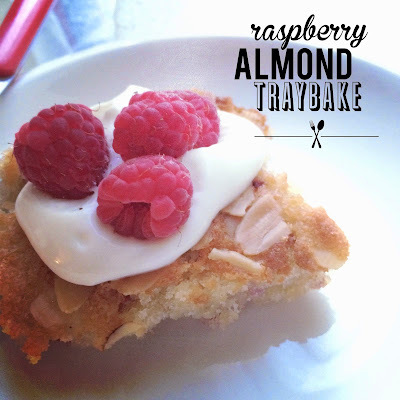 Pour into tray and top with remaining raspberries and and sprinkle the almonds. I baked for 25 mins until golden and cooked through.